Québec International has distinguished itself once again by earning two awards of excellence from the International Economic Development Council (IEDC) at its International Conference, which was held in Fort Worth, Texas, from October 19 to 22, 2014. Québec International won Gold in the category of cities with a population greater than 500,000 for its customized e-newsletter and Bronze for its technology entrepreneurship program. 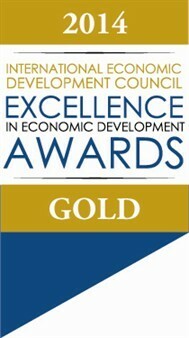 Last year, IEDC presented QI with the Gold award for its Invest in the Québec City Region brochure. 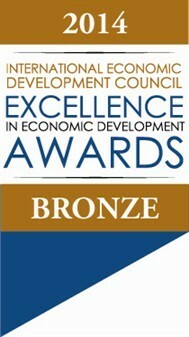 The IEDC awards of excellence acknowledge the best economic development promotional programs and tools among the association’s 4,400 members. The recipients are organizations or individuals who have contributed to the growth of their community. 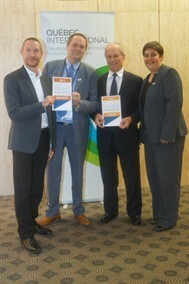 From left to right: Sébastien Tanguay, Director – Technology Entrepreneurship, Carl Viel, President and CEO, Dr Fernand Labrie, Chairman, and Isabelle Gilbert, Senior Director – Communications, Public Affairs and Economic Studies. Launched in June 2012, Québec International’s weekly e-newsletter now boasts over 4,400 subscribers. Each week they receive a review of economic news tailored to an interest profile that they themselves have defined. This customized e-newsletter helps them keep abreast of what is happening in their industry or informed about topics of interest such as exports, human resources, and entrepreneurship. Over 630 “customized” versions are sent to subscribers every Friday, providing them with an agenda of business activities and training that targets their interests. Québec International’s technology entrepreneurship support program includes a broad array of activities and innovative consulting services. Québec City entrepreneurs can take advantage of coaching and professional development services as well as access to funding and national and international partners whatever the stage of development of their high tech business project. “Québec International’s team of professionals works hard to provide innovative solutions and customized services to companies in the Québec City region to help them grow and maintain a competitive edge. These two international awards recognize the quality and pertinence of their interventions and encourage us to continue in this direction,” said Carl Viel, President and Chief Executive Office of Québec International.